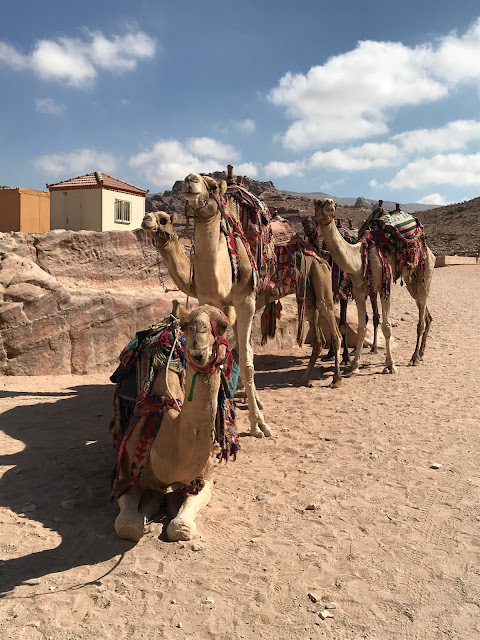 The second day of our adventure in Petra began with a hearty breakfast and then coffee outside near the pool. It was still pretty fresh (perhaps I should really say surprisingly fresh given how sunny it was) early in the morning so I'm not sure you'd want to be going for a swim. It was incredibly peaceful that early though, just us, a couple of other hotel guests and one of the neighbourhood stray cats. You have to agree that that's a spectacular view to enjoy your morning coffee with. After breakfast we met our taxi driver and arranged for him to take us to a different entry point into Petra so that we could reach the steps (the point we reached on our first day) to climb the Monastery. 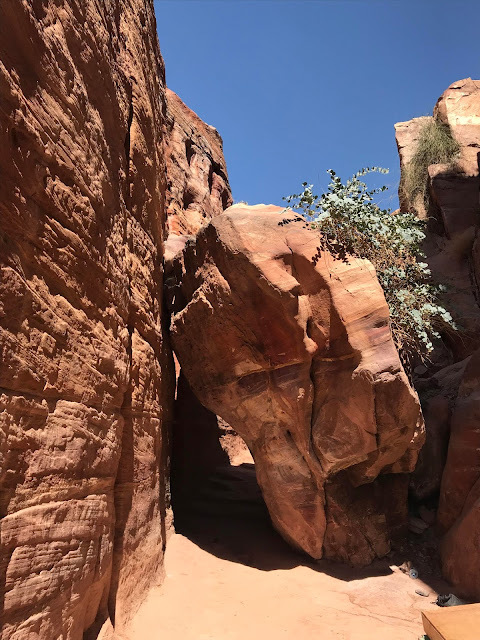 This alternate entrance, by the village of Umm Sayhoun which grew up as a result of the Bedouin being resettled from Petra in the 1980s, is almost like entering Petra via the backdoor. 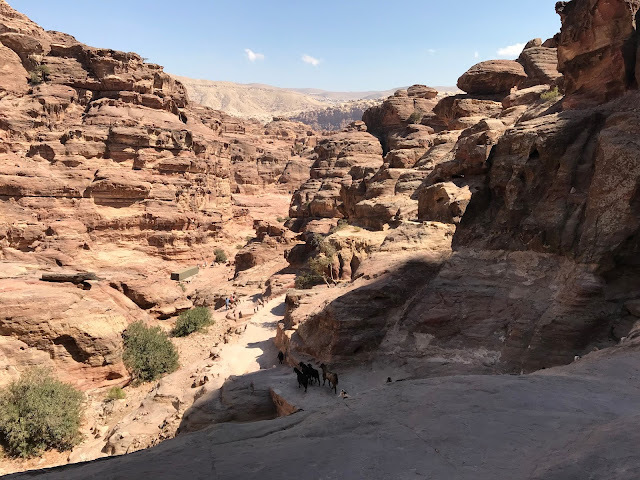 Whilst I wouldn't recommend doing it on your first day in Petra it's definitely worth considering if you are planning a day just climbing the steps up to and exploring the Monastery. It's a shorter route than entering via the main entrance and walking through the Siq and past the Treasury again. It's important to note though, if you want to go this way, that there is no ticket office here but you need a ticket to enter the site and they will be checked, hence it's definitely better to take this option on your second or subsequent day at the site. Plus on that first day you really do want to see the wonder of the Siq and follow that route into Petra. You can probably make out the access road in the photo below which is the route you follow to get to the stairs leading to the Monastery. Whilst you may not be walking through the wonder of the Siq this way you certainly still get the wow factor from the scenery with the sandstone rocks and hills surrounding you. This way gives you an idea of the vastness of the area and the first opportunity (we had at least) to get the place pretty much to yourself. It was only when we reached Petra's old city centre that we really met with any other tourists, so well worth doing if you want to escape the crowds for a while. 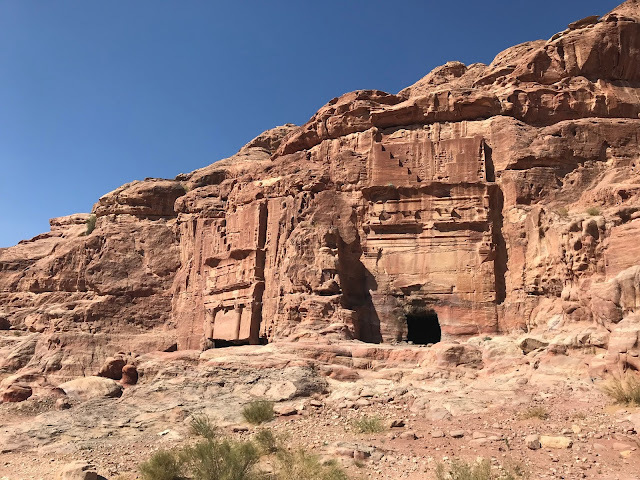 As you walk through the sandstone hills you also get to see a few more of the many tombs that are dotted around this whole area. 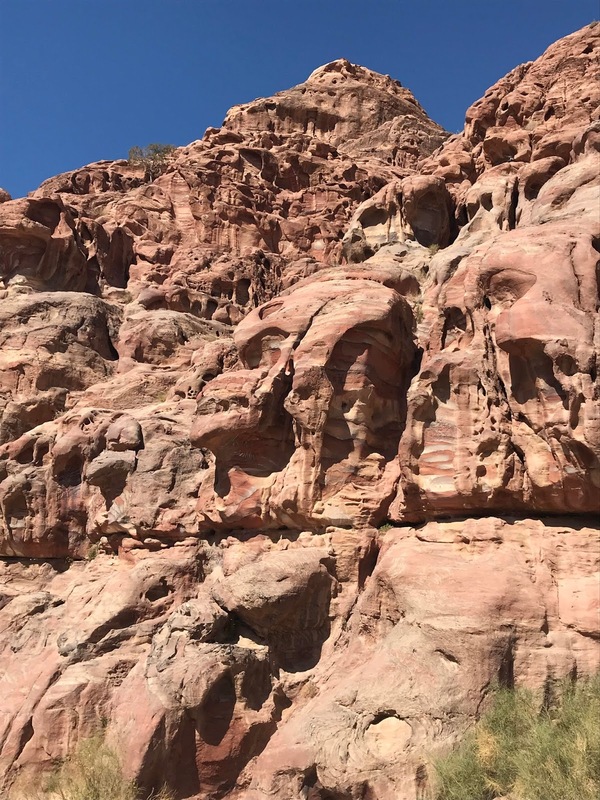 Does anyone else think this looks like a skull jutting out of the rocks? 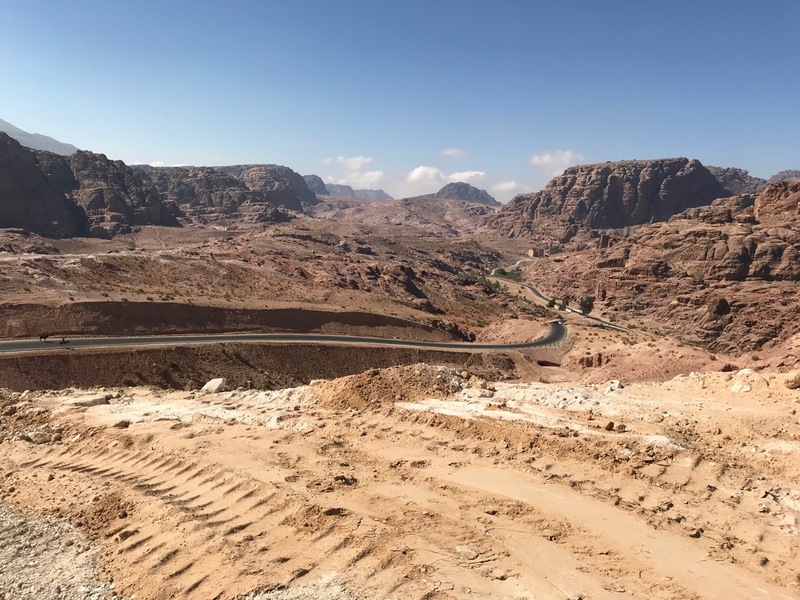 After a pleasant walk we soon arrived back at the point where we finished on our first day at Petra. 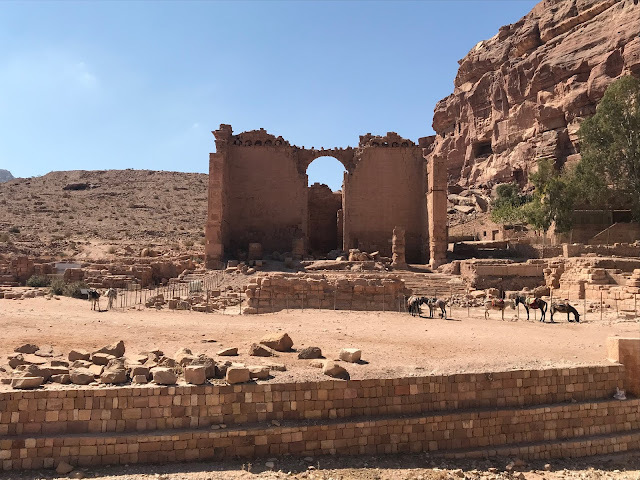 Immediately in front of us was the Qasr al-Bint which is one of the few free-standing structures in Petra. It was built by the Nabataeans around 30BC, later adapted by the Romans and eventually destroyed around the 3rd century AD. Standing at 23 metres high, it was originally the main and most important temple in Petra, dedicated to Dushara a Nabataean God. After a pre-climb drink at the restaurant we stopped at for lunch the previous day, we began climbing the stairs to the Monastery. The climb takes about forty minutes with more than 800 steps in total. I'm not going to pretend that it isn't a little tough in places. Mainly because the steps are uneven and in parts, as it's an ancient route cut into the rock, don't really pass for steps at all. The route follows the old processional route to the Monastery, quite something to think about the many ancient feet that must have trod this same path. As I said in my first post, temperature wise I think we picked a good time to be there (October) but we did get warm on the climb so definitely go prepared with water as well as suncream, hat and sensible shoes. If you don't fancy doing the climb yourself there are donkeys and guides you can hire but I've got to admit I wouldn't fancy doing the descent on one. The donkeys obviously know the paths and stairs well, they come down at quite a speed and it's fairly steep in spots. Personally, as we did, I'd opt for the walk both ways, this way you can take it at your pace, stopping where you wish to catch your breath as well as enjoying the stunning scenery. There are several souvenir and drinks stalls on the way up as well as many convenient spots to move to the side and take a rest so definitely no need to rush up if you don't want to. 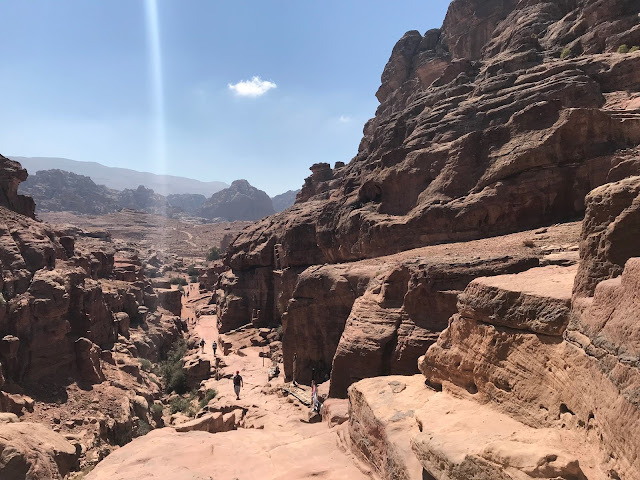 Though the climb may be tough in parts the reward at the end is well worth it, walking around the corner from the final few steps up and coming face to face with the Monastery for the first time is certainly breath-taking. 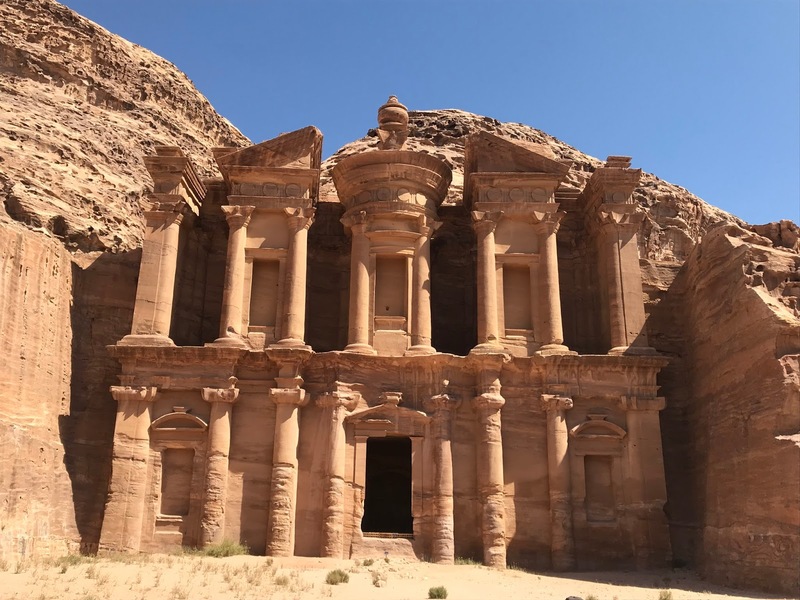 The Monastery, or Ad Deir, is one of the largest monuments in Petra and was also built by the Nabataeans as a tomb originally in the 3rd century BC. It gets its name from crosses that have been carved on the inside walls, suggesting a subsequent use as a Byzantine church. The courtyard space in front of the Monastery was once used for sacred ceremonies. 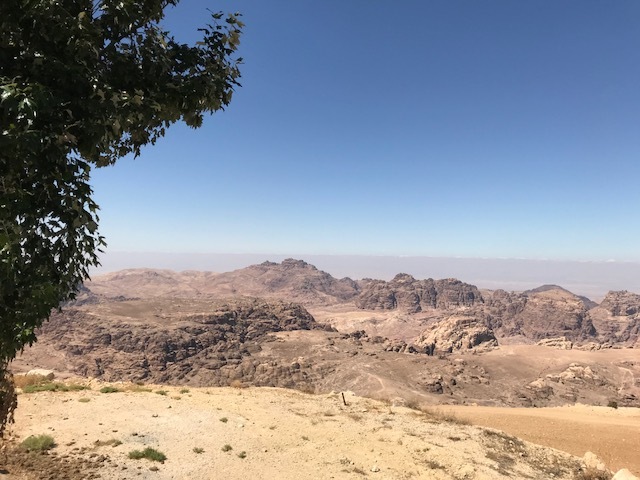 Handily, and just like at the Treasury, there is a teahouse across from the Monastery which is great for taking a break after the climb and for taking the time to enjoy the view in front of you with an Arabic coffee. Once you've taken a break, you can continue further for another slightly higher view point. I've read since that the views from there are pretty stunning but I'm afraid by that point we were just ready for a drink and then to begin the descent back down again. Have any of you walked just that bit further to take in these views too? Our second day at Petra was just as fabulous as our first and we definitely got plenty of exercise climbing and then descending all those stairs. When we got back to our day's starting point at the bottom of the stairs we walked back along the main route past the Treasury and back through the Siq to the main entrance. Once again, after all that walking, our day ended with a well deserved drink at the Cave Bar in the hotel just next to the entrance and the chance to reflect on the amazing sights we'd seen that day.